Tomorrow is the soon to be released collection Hearts and Hugs - Summer Collection designed by the Magical and Oh So Fun Artistry of Victoria Case for SCACD Stamp Co. I will tell you these images make you think of getting together with Friends, summer breezes and vacation travel!!! Victoria weaves such a wonderful magic that you see these images come to life. What makes this collection even more FUN if you buy the set of 7 images there will be 2 bonus accessory stamps ONLY available with the set!!! And guess what.....I am one of the lucky winners of the blog candy give away!!!!!! I am so excited and overwhelmed. Susana & Suzanne are so super sweet. I can't even gather my thoughts to relay to you how happy I am. I hope THANK YOU will work! I wish you all a wonderful weekend! Be safe & have some fun. Check out the blog hop being done tomorrow by Susana's talented design team. Hop on over to the store's blog for more details. My parents will be celebrating their 43rd wedding anniversary on the 25th and I wanted to create a card just for them. I am a little late in mailing this since it has to travel from WA to UT...but they won't mind. I will give them both a quick email and phone call on the "day" so they will know I didn't forget. I am their one & only so it is all up to me! 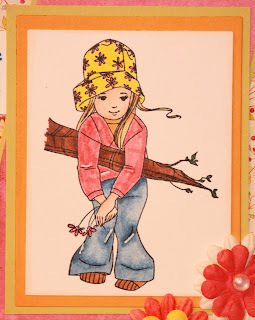 I decided to use this super sweet image by Elizabeth Bell and Bells 'n Whistles Stamps called Sweet Love. Isn't that just perfect? Summer, the owner of Belles 'n Whistles is one of four stores in the US that is working exclusively with EB and her stamps are just super cute. I dp I used is from K&Co. called Classic K (I think). I just love all the colors and paper choices this pack had. I tried to keep it neutral so my dad didn't get something too feminine. I am learning more & more about shading with my copic markers. The cardstock I used is from PTI and on their website they have a chart that tells you what color copics work in conjunction with their colors. For me that is a tremendous help. I added a close up shot of the image so you can really see the cuteness factor! I used this week's sketch by Jen del Muro. I just love her sketches & decided to give it a try for this card. She has some lovely ideas on her website. Have a lovely rest of the weekend and don't forget the LOST series finally is tomorrow night. This is a must see and I am sad to see it leave the air but I know the ending will be great. Have a lovely evening. Hanging around on a Wednesday evening! Tonight I would like to share a super cute image from Elizabeth Bell and Belles 'n Whistles. I am answering the call for a design team member with Belles 'n Whistles. The wonderful owner Summer has four spots open and the ladies on the team are just amazing. I created a birthday card for my BFF that will arrive to her late. I misjudged my time but will send her wishes in other ways. This just keeps the celebration coming! I used the super cute Smile stamp. She is just hanging out on a limb enjoying her day. Isn't she a cutie? I just love the hat she is wearing. The dp is from Basic Grey and the cardstock is from PTI. I custom colored the flowers with my copics. I love how you can customize white flowers...and don't you just love the bella baubles? Sorry I am not very interesting today..I think I am getting punchy. Have a great evening. Today at the Craft Critique Blog you will see a wonderful list of Mother's Day gifts....and I am one of them. This is my first "spotlight" so hop on over & check out all the fabulous ideas. Pass the word on, lets all share the love. Have a wonderful weekend and a happy Mother's Day to all the mom's and grandmother's out there. Using this wonderful designer paper from SU called Persian (I think) and Bahama Breeze cardstock. This dp was only offered for a limited time and I just love it. I hope it comes back sometime. The monogrammed stamp is from JustRight Stampers. I love the possibilities you have with these stamps. The gift options are plenty. I created a set of eight cards with decorated envelopes.